Riding in the indoor of course is nice, but there is nothing like riding outside in the fresh air with a great view. 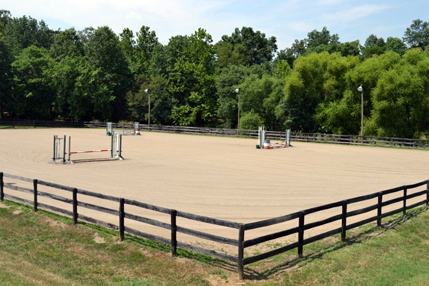 Finding the correct footing for an outdoor arena can be tough at times; here are a few things to look for when choosing footing for your outdoor arena. Your arena should be able to be wet and still ride on; it should not become slippery and or hard after getting wet. There are a few footing options that can become very slippery even with the slightest amount of moisture such as dew on your arena. Slippery arenas can be catastrophic for your horse. It should also not be rock hard after rain. Some types of sand will become almost like concrete after rain, not something you want to have to spend time on trying to break up. If you have additives in your footing, they have to be held in the footing. For example: if you have fibre or smaller rubber additives, they should not be blowing away with the wind. You don’t want to watch thousands of pounds just drift out of your arena and across your property. Equipro’s riding surfaces provide a fantastic footing with reduced dust compared to sand and other traditional fibre riding surfaces. You can use our surfaces in virtually all weather conditions and throughout the year!